The movable house is complete. Now the trial phase begins. After some four months of production and one month spent on assembly the trial phase of the movable house can finally begin. 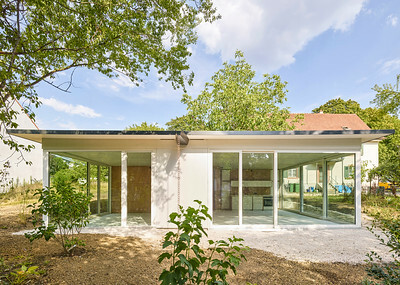 The residential home by Rahbaran Hürzeler Architects is a prototype that – as implied by its name - has not been developed with a specific site in mind, but should rather be "movable". In the long run the client intends to reassemble the project at another location. Easy and efficient transport of the structural elements are a prerequisite for the quick process of dismantling and reassembly. What makes this building special, however, is not only its independence from a specific site. It also combines different aspects of sustainable building coupled with technical innovation, static challenges and captivates through its simple structure with functional and flexible spaces. Optimisation of the element and module construction already began during the production of the individual segments in the workshop. 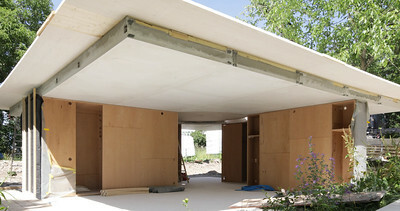 In comparison with traditional massive concrete roofs the prefabricated ribbed slab used 70 per cent less concrete; the material saved by this construction process reduces the environmental impact as well as investment costs to a minimum and simplifies possible dismantling and reassembly. The combination of this newly developed prefabricated roof system with the wooden elements is also remarkable. The putting up of the prefabricated wooden cores and the roof system on site took only two days. However, material saving also means a reduction of storage-mass. For this reason phase change material (PCM) elements made of salt and wax were moulded into the concrete floor. Compared with traditional construction materials these elements can store a multiple of energy and then gradually feed it back to the residential areas. This leads to a balanced indoor ambient climate. Since its completion in August the building has been providing initial data that is gathered by the Institute of Energy in Building of the FHNW University of Applied Sciences and Arts Northwestern Switzerland. Sensors record the temperature of the rooms, the floor and ground as well as the total electricity usage and the production of the photovoltaic system and also the use of heating and water consumption in ten-minute intervals. The entire heating, cooling, warm water and electricity produced comes from renewable energy sources. In combination with the energy-efficient building envelope this has a positive effect on the total energy consumption. The thermal insulation and the optimised on-site use of solar energy lead to the heating demand undercutting the regulatory requirements by 40 per cent. At the same time the annual output of the solar system exceeds the total use of the building. Besides reducing the energy demand in production, transport, storage and running the building also impresses with its efficient overall footprint. A family of four shares a floor area of less than a 100 sq m (1,070 sq ft). This represents a sustainable use in the socio-cultural sense. 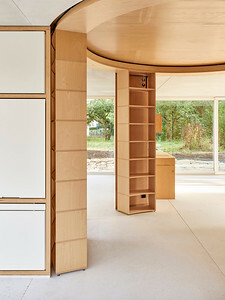 At the centre of the pavilion-like building is the circular library and retreat. All rooms are accessed diagonally from this internal distributor. This concept creates a flowing trajectory and an open atmosphere. The cross-shape floor plan is structured by the four enclosed cores. 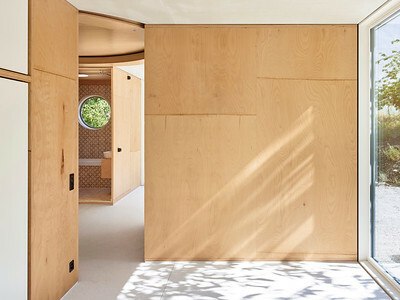 These contain the entrance area, bathrooms and spacious built-in wardrobes. Together, the four wooden volumes support the cantilevered, prestressed concrete roof elements. The building appears to melt into its surroundings thanks to its fully glazed skin. High-quality materials could be employed due to the minimised overall use during construction and the simplified structures themselves. The load-bearing cores are made of multi-layer beech wood panels and the concrete elements are cast in white cement with added Carrara marble. This completed pilot project in the Swiss town of Basel is meant to show the way forward for subsequent projects. Insights won from the manufacture of the prefabricated modular system will provide the basis for industrial production. The test phase enables concrete opportunities to compare the thermal simulation with the actual energy consumption in everyday use. The long-term aim of the application-oriented research is to develop marketable products and projects. In this sense, the movable house will keep on moving.